Sometimes documents are presented in a boring black folder or navy binder. Why not add some style to your presentation? To display a more polished report, use C-Line’s colorfully styled Report Cover with Swing Clip to not only make your files stand out more, but also be protected. The uniquely designed swing adds a little detail without it being over the top. It is most valued for office and educational uses due to its ability to hold up to 25 letter-size documents. Plus, the clip can easily open for adding or removing pages. It also closes securely keeping documents from falling out. The translucent polypropylene cover is heavyweight, which prevents pages from being folded or ripped. The frosted front cover also allows you to be creative by customizing a cover page that is visible from the front. This heavy-duty report cover provides a more professional look, while making it easy to access documents. Have you used C-Line’s Report Cover with Swing Clip? Tell us how this helped you in your presentation. Coordinate your Clip N’ Go Report Cover to match with your company’s logo! Are dividers, binders and folders not keeping your desk organized like you wanted to? 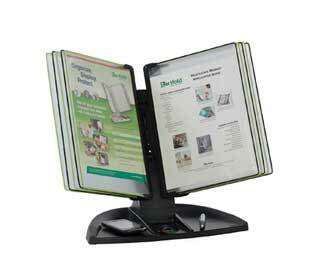 Use Tarifold’s Black Line Desk Set that not only can protect information, but also store office supplies. The desk set comes with ten wire-reinforced, two-sided non-glare polypropylene pockets. The black and green double-sided pockets allow documents to be more visible and increase storage space. If more information needs to be added, additional pockets can be purchased to expand the set. Another feature of the organizer is the black base, which is suited for any environment. It also has three compartments to store smaller items, such as paper clips, pens, sticky notes and cellphone. The organizer is valuable for any user, which it can be used to refer to information at your fingertips and store small items in the stand. How would this product help organize your desktop? Let us know in the comments! The Desk Set is expandable up to 20 – 30 pockets and snap-on index tabs are included. TVs are getting flatter, computer screens are getting bigger and technology is getting better. However, the wires that power these electronics haven’t really minimized over the years. Imagine how frustrated we get with tangled headphones. Now imagine all the tangled wires behind a TV stand or behind the large network server at a company? Isn’t that just frustrating! Alliance Rubber IT Cable Wrapz can not only help organize wires, but also help identify which wires belong to which device. The wrapz are weather, UV and ozone resistant because they are made from ethylene propylene diene monomer material(EPDM). The life span of the bands are also prolonged due to the material. In addition, the bands are non-conductive and non-metallic. Therefore, it would protect you from being electric shocked but also not induce line noise or cross talk. There is also a “write-on” section where you can label which wires belong to which device. Use Alliance Rubber’s IT Cable Wrapz to avoid clutter and tangled wires. Keep your work station organized and stay connected with technology without the fuss using IT Cable Wrapz! Want to customize your own writing space? Want to write wherever you want? You can turn any surface area in your office into a dry erase writing space with GoWrite’s Self Stick Dry Erase Rolls. The Self Stick Dry Erase Rolls has adhesive on one side, which allows you to place it on any flat area. Also, it can be adjusted to any size or form to fit different areas. The rolls utilize an ultra repositionable adhesive that can be removed cleanly from surfaces. There are 4 different sizes of roll available, which gives more variety in making the rolls into different size dry erase sheets. Educators, student, or business professionals can place it somewhere visible and use it for presentations or meetings. Draw any design or jot down any notes and once you’re finished using it, erase with a dry erase eraser. How would you use and customize the Self-Stick Dry Erase Rolls? Please share with us down below. The rolls are available in four different sizes, ranging from 18 in. x 6 ft. to 24 in. x 20 ft.
To be more efficient at work sometimes mean to be well organized. Kleer-fax has an 8000 Series Avery Style Letters Collated Sets Side Tabs that can help sort and divide documents to access information quicker and more efficiently. These durable legal dividers are not only green but also very useful. They are made with a minimum of 30% post-consumer waste and they come in collated sets. The collated set provides more sorting options to assemble all kinds of documents. Plus, the unpunched dividers can hold letter-sized documents and can be punched for a variety of binding systems. The Kleer-fax dividers have laminated side tabs that are printed front and back. The dividers have side tabs that are laminated to enhance the sturdiness and prolong the life of the tabs. They are labeled with letters ranging from A to ZZ and 1/26 cut. The letter tab labels can help find needed documents right away. If more organization options are needed, the 8000 series is interchangeable with Avery’s style of exhibit dividers. Have you used this 8000 series divider before? How did you use it to organize your files? Every library, classroom and office should have Sandusky Buddy Products’ 6 Wheel Utility Cart. The cart makes it easy to move books and documents from place to place with a simple push. Even with 6 wheels, the cart has a tight turning radius, which is very beneficial to maneuver in small and tight areas like a classroom or office setting. Plus, the top and middle shelf each can store up to 75 pounds and the bottom shelf can hold up to 150 pounds, which is sturdy enough to carry heavy books and other items. This cart has two different shelf styles available that gives it more variety. Use the flat shelves to store books upright for more visibility or place files on it to ensure that they do not get lost while being transported. The slanted shelves store books upright, minimizing dust falling onto books directly. This type of unit is valuable for a librarian or teacher because books can be easily viewed and stored on the cart. Would you use the 6 Wheel Utility Cart in library or small area? Let us know your thoughts in the comments. The wheel cart is shipped assembled allowing you to store and move books right away. Information is key to all jobs. Therefore, it is important to protect and present paperwork properly. C-Line can satisfy your expectations with the Two Pocket Shop Ticket Holder with Hanging Strap. Documents are not only able to stay intact, but it also has extra storage space to hold more paperwork or writing utensils. The Dual Pocket Shop Ticket Holder can be used in any environment, but mostly is ideal for industrial environments. The vinyl material allows it to withstand in harsher conditions. Also, the holder has reinforced black stitched edges that prolongs the life of the holder, which in other words mean that documents stored inside will have a longer life span. The convenient hanging strap and metal eyelet at the top is another benefit. It allows paperwork to be present and visible at all times. Plus, the one large and one small pocket provides more options to store various sized items. The large pocket can hold papers, catalogs, schedules and more. The small pocket can hold keys, notes, and all other related job information. The durable vinyl shop ticket holder will protect anything stored inside the pockets. Let us know how you would use this C-Line product. The 9 x 12 pocket can hold letter-size items and the 9 x 6 pocket can hold smaller items that are related to the tasks. There are many expanding files on the market and each has its own unique feature. Tarifold’s Expanding File Case is great to transport valuable documents, which is ideal for the contemporary office, school and university student. The Expanding File Case is made with polypropylene making it more lightweight compared to a traditional suitcase. In addition, the durable material can protect papers and files from scratches and resist water. The retractable handle on top of the case also allows transporting documents from one place to another while keeping information inside sorted and organized. The expanding file case can stretch open that allows more storage than a one pocket case holder. Plus, the colorful index tabs make it easier to sort and identify files. The transparent outer shell gives some visibility of the type of documents stored inside. Tarifold Collection Expanding File Cases are easy to carry with retractable handle and easily transportable. Have you used Tarifold’s Desktop Expanding File? Let us know what you think in the comments below. People tend to lose track of time when tasks and events build up without any prioritization. An effective way to be more in control of your time is to write down dates or jot down notes. GoWrite has large sized Self Stick Dry Erase Sheets that are ideal for staying on top of plans. The GoWrite! Self-Stick Dry Erase Sheets are easy to use. Simply peel back the liner and adhere to almost any surface such as walls, refrigerators, desks, doors and more. This allows you to use it in the classroom, office or at home. Use it with a dry erase marker and once you are done with it, erase the writing off the dry erase surface. The sheets can also be repositioned and moved to a different location if needed. In addition to jotting down notes, the sheets can be printed using laser printers and copy machines to create customized calendars, graphs and more. The dry erase sheet is a unique way to encourage you to prioritize your tasks but also be organized. The Self-Adhesive Dry Erase Sheets can be used with laser printers to create customized design learning aids, calendars, graphs and more. You are currently browsing the Directly Yours Blog blog archives for June, 2017.